Ink Sack is the brainchild of “Top Chef” season-six winner chef Michael Voltaggio, but this place exists without any pretense or reality-TV hype. Voltaggio seems happy to lay low and let his food speak for itself. 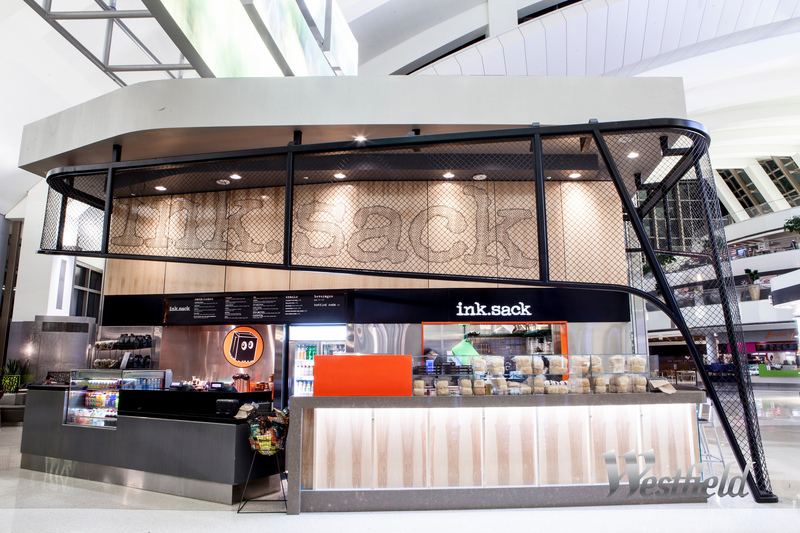 After opening two restaurants in West Hollywood — Ink, a fine-dining establishment, and Ink Sack, a slightly more laid-back and affordable sandwich shop (most menu items fall in the $4 to $7 range) — Voltaggio decided to open a second Ink Sack in the international terminal at LAX. The sandwiches at Ink Sack LAX are all reasonably priced, just like those at his WeHo location. Try the cold fried chicken or the Jose Andres — aka “the Spanish godfather.” Or, at these prices, why not get both? If you’re a vegetarian, try the veggie banh mi with barbecued tofu, or the tortilla española with caramelized onion, chips, egg, manchego and mayo. Ink Sack gets bonus points for creative sides like homemade crab chips, chile and lemon marinated pineapple, and the “Oreo cookie cookie,” a chocolate chip cookie with crushed Oreos in the batter. Ink Sack opens early and closes late, so stop by any time you fly. Terminal 2 is the place to eat if you’re flying through SFO. While it may be the smallest of the airport’s three domestic terminals, recent renovations and regulations have drawn national attention to the terminal and its food court. Terminal 2, which reopened in April 2011 after an overhaul that included LEED gold-certified status and Fritz Hansen Egg chairs, now requires all its restaurant tenants to serve hormone-free dairy products, cage-free eggs and sustainable seafood. 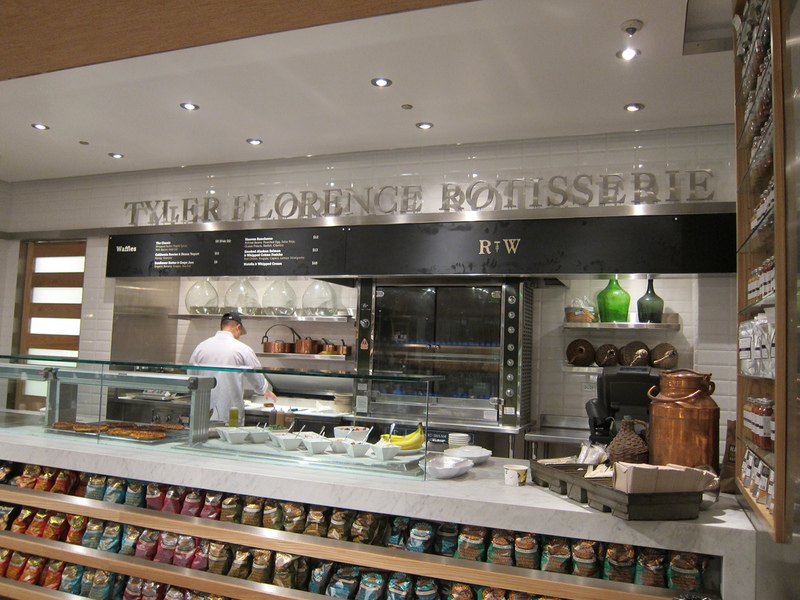 Tyler Florence Rotisserie is tucked into a corner of Napa Farms Market, a type of gourmet cafeteria. You’ll likely smell it before you get there. Anything pork-related is a solid choice here: The porchetta (Italian roast pork) sandwich and the pork shoulder plate are especially delicious. The rotisserie chicken is also delectable, and don’t forget the gooey mac and cheese. When you’re done gorging yourself at Tyler, awaken from your food coma by browsing the rest of the gorgeous (though sometimes pricey) Napa Farms Market, where you can sip small-batch roasted coffee, taste local Napa wines, and munch on a cupcake from Kara’s. Celebrity chefs seem to have a corner on the airport restaurant market, with Tortas Frontera the third celebrity-owned restaurant on our list. A recognizable name may help these chefs land desirable pieces of real estate, but the restaurants persist on their quality food. 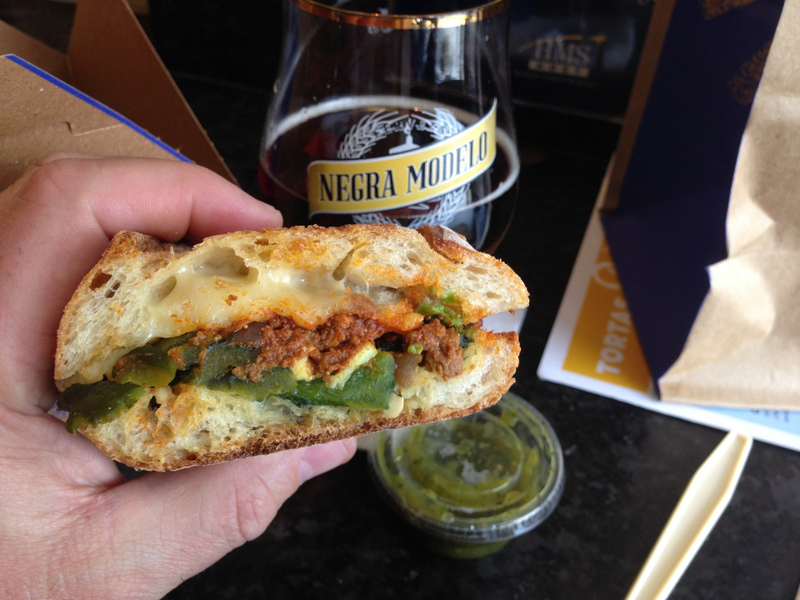 Rick Bayless’ Tortas Frontera is no exception. Bayless, an Oklahoma-born chef who traveled extensively in Mexico before settling down in Chicago, is a master of accessible modern Mexican cuisine. While some of his fine-dining establishments are über fancy and downright pricey, Tortas Frontera is affordable, generous and delicious, and not just by airport standards. Tuck into a torta (a Mexican-style grilled sandwich) like the pepito, with beer-braised short ribs, creamy Chihuahua cheese and tongue-tingling pickled jalapeños. Wash it down with a smoothie, agua fresca (like raspberry prickly pear), Mexican beer or a house-made margarita. Coming into ORD on a red-eye? Tortas Frontera opens at 5 a.m., welcoming you to Chicago with the restaurant’s tasty, hearty breakfast sandwiches. If you’re a fan of Texas barbecue, you’ve probably seen iconic images of The Salt Lick’s famous open barbecue pit at its original location. It adds a dramatic touch and intense smoky aroma to their Driftwood, Texas, restaurant. 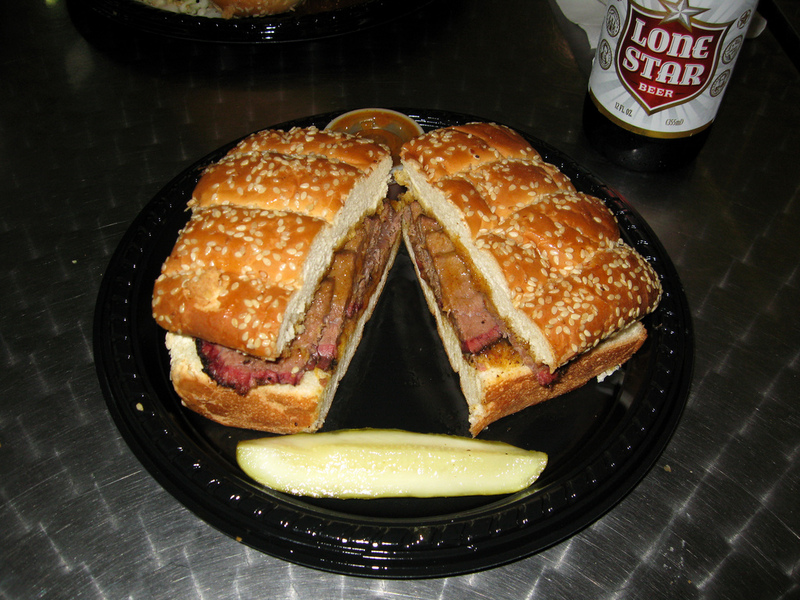 But you can still enjoy The Salt Lick’s offerings at the Austin airport, without the open fire. If you’re a fan of brisket, look no further. The Salt Lick’s brisket is lean yet moist, with a gorgeous smoke ring around the outside of the meat. You also can’t go wrong with the pulled pork, homemade snappy sausages, or various meat-filled tacos from the nearby Salt Lick Taco Bar. Whatever you end up ordering, you’re pretty much guaranteed to transcend to barbecue nirvana. But don’t be surprised if you’re soon back again for more. The New York area has three major airports, each with dozens of restaurants to choose from. But tourists and locals alike flock to one of the two Shake Shacks now in JFK. It might not exactly be fine dining, but Shake Shack is an institution in New York, and for good reason. The line to order can sometimes stretch on for upward of an hour. However, that is not the case at JFK, where you’ll rarely wait more than 10 minutes to place your order. 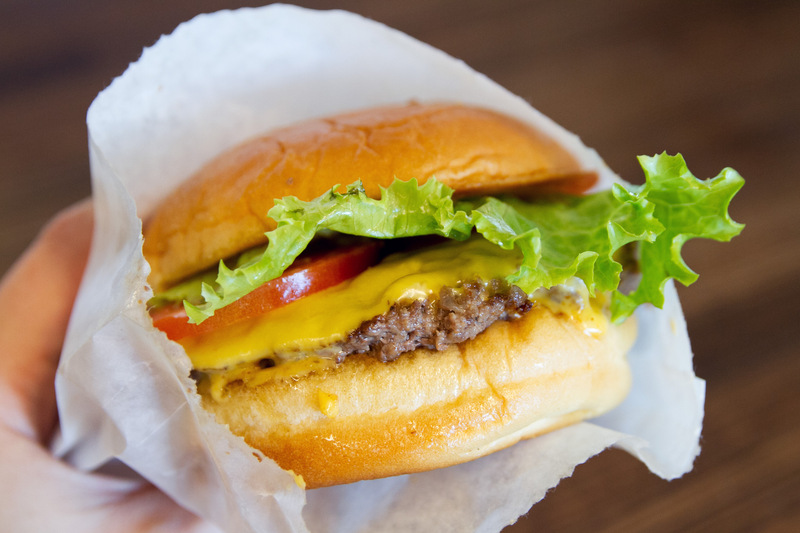 Shake Shack does the standards — nothing fancy — and does them right. It makes quality burgers out of 100 percent all-natural Angus beef, vegetarian fed and humanely raised. Rounding out the menu are the crinkle-cut fries, velvety smooth custard shakes, and the ‘shroom burger for vegetarians, made with a whole roasted portobello mushroom. You can choose something on the menu or make your own burger. Choose from standards like lettuce, tomato, pickles, onions, cheddar cheese and applewood-smoked bacon, or spice things up with some chopped cherry pepper or muenster cheese. But if you’re in the mood for something else entirely, they also serve hot dogs and now — exclusive to only a handful of locations — breakfast. Try the Niman Ranch egg sandwiches on toasted potato buns, which you can wash down with a hot cup of Stumptown java. Most Angelenos will never fly out of the Santa Monica Airport, not when the behemoth LAX is just a bit further south. But that doesn’t matter, because you don’t need a ticket to eat at Typhoon. At Typhoon, you can watch planes take off and land as you devour foods from across Asia, from Mongolian beef to Vietnamese pho to Malaysian kway teow. Or if you’re feeling really adventurous, why not try some delicious, protein-packed bugs. No, that’s not a typo — Taiwanese crickets, to be exact, stir-fried with garlic and chile, a perfect blend of savory and spicy. 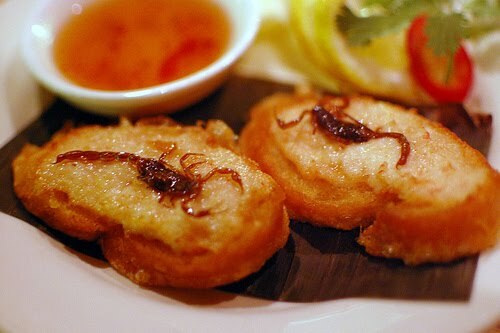 Also surprisingly delectable (and not at all venomous) are the scorpions on toast. Of course, if you’re not feeling quite that adventurous, Typhoon has plenty to offer in terms of fare that’s a little less creepy crawly, including Chinese crispy duck and Korean galbi, marinated and grilled short ribs. Bon appetit! Did we miss any of your favorite eateries? 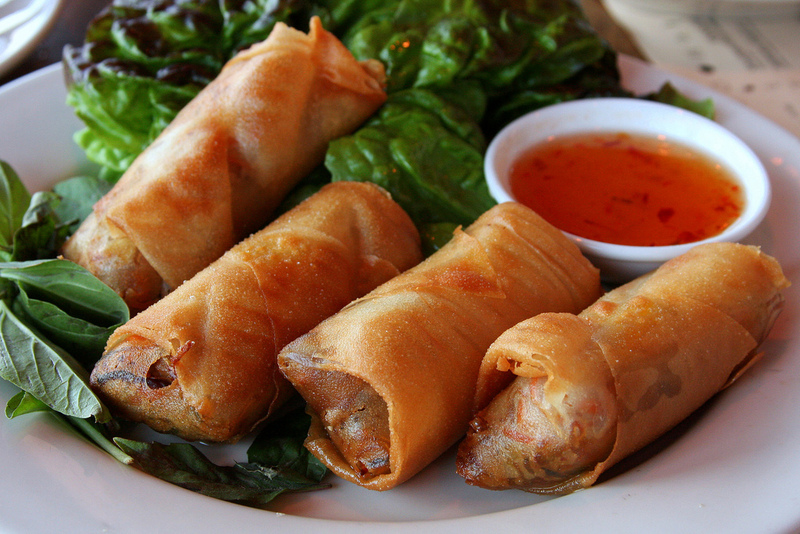 Leave a comment below or head to our Facebook page to tell us your favorite places to dine when you’re on the go.